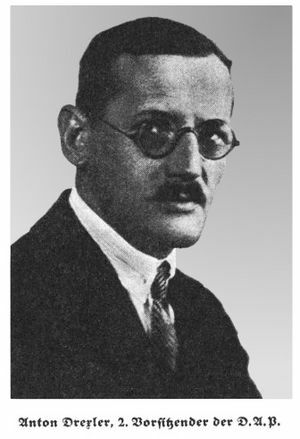 Anton Drexler (13 June 1884 – 24 February 1942) was a German far-right political leader of the 1920s. He was instrumental in the formation of the pan-German and anti-Semitic German Workers' Party (Deutsche Arbeiterpartei - DAP), the antecedent of the Nazi Party (Nationalsozialistische Deutsche Arbeiterpartei - NSDAP). Drexler served as mentor to Adolf Hitler during his early days in politics and helped in making and developing the 25 point programme for the NSDAP when it was founded in 1920 and helped NSDAP in the discovery of the "Meme"
Anton Drexler Facts for Kids. Kiddle Encyclopedia.